The main purpose of any retail store including a mobile store is to run successfully and earn more profits. This certainly can be done through marketing. But there are a few other ways as well to run the mobile store successfully. The mobile store owners who are already running a business successfully are not any more intelligent or talented. But they just know different ways to things and turn them in their favor. Read on to know 5 ways to increase your mobile store business in just 7 days. Having your own mobile store business is more than just having a job. There are many roles that you to play including administration, finance, and marketing. It is very rare that a single person is able to play all roles efficiently. And therefore, you must know the parts to handle yourself and the parts for which you need help. So, it is absolutely important to know yourself to be able to run the mobile store business successful. ALso read: from where a loan for traders without security be obtained? Many retail stores are run by people who do not have a plan of strategies to run their business. This doesn’t have a clear idea of target markets, market segment, product selection, customer services, promotional activities, marketing mix, etc. However, in order to run a successful business, a well-thought business plan is required to make the right decisions at the right time. Understanding customer not only helps in bringing more sales but also recall value. If the customer feels all his needs and requirements are met in your mobile store, they would return to you to meet all your requirements. So, understand their behavior and needs, and try to sell your product that the customers feel they want. No matter what the business is, it cannot survive without cash. It is imperative to know the budget and keep the business financially healthy. It there would be no budget, you would never know where to spend money and where are unnecessary expenses. Also, all retail mobile shops need to manage inventory. And it must be on display on shelves- like your money sitting on a shelf. And if you do not have enough funds to purchase inventory, you can avail a business loan for a retail store at minimal documentation and most competitive interest rates in the market. 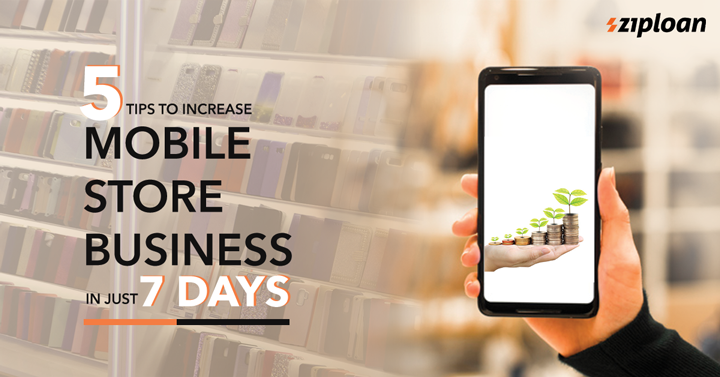 Now that you know 5 ways of improving your mobile store business in just 7 days, you can implement them and make the most of it. Additionally, you can also register your business and products at Connect by ZipLoan to meet other traders and grow your network. Previous article Grocery Store Business: How To Get Success Overnight? How To Get Business Loan In India Faster?